Wrist watches for men became popular during World War One when the convenience of having a watch on your arm instead of in your pocket became a practical necessity. 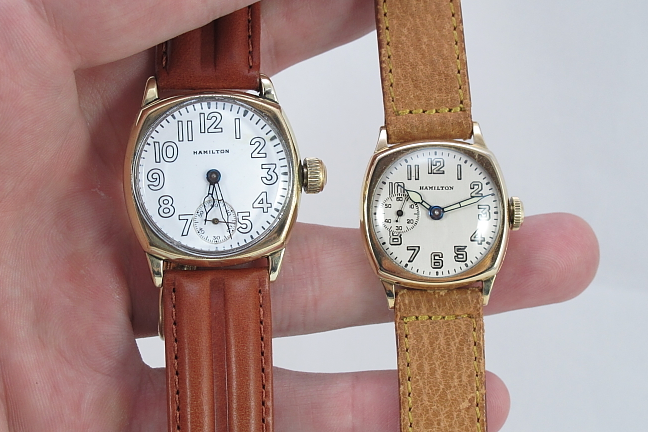 These early wrist watches were even given the name "trench watches" because of their utilization by military personnel. In addition, they are often found with grills that cover the glass crystal to protect it from damage. They're called "shrapnel guards". Many trench watches were converted pocket watches... often smaller ladies sized movements. 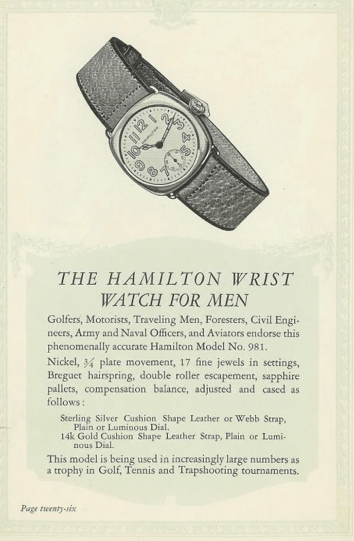 In 1919 Hamilton introduced the first wrist watch for men called "the Cushion". The Cushion was very similar in design to the smaller 6/0 sized Cushion that would be introduced in 1924. In fact, from the general appearance of the catalog ad it's hard to tell just how large, or small, the 0-size Cushion really is. Speaking of sizes, American watches typically were expressed by "size", defined relative to the diameter of the main plate of the watch. European watches used the units of "Ligne" related to the diameter of the main plate. But the two units of measure don't always translate smoothly. 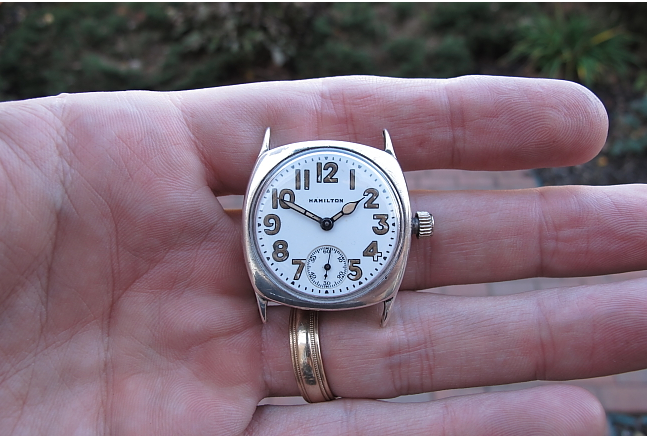 Vintage Hamilton watches are expressed in "size". In order to explain, let's start at zero (0). A 0-size movement is 29.62mm. A 1-size is bigger than a 0-size but smaller than a 2-size. A 3-size is bigger than a 2-size but smaller than 4-size. And so on. To go smaller than 0-size the units are expressed as a fraction. So a 1/0-size is smaller than 0-size but bigger than a 2/0 size. At an extreme, an 18/0 size ladies movement is way smaller than a 18-size pocket watch movement. Make sense? If not, here's a table. Getting back to the 1919 Cushion, as you can see an 0-size is about 4mm larger than the 6/0 movement used in 1924. These watches generally used the 17 jewel 981 movement, although 983 movements were also used (I believe they are also engraved "Lady Hamilton"). Although there were a few thousand of these movements made, they are exceedingly scarce and command a great value when they are available for sale - even for non-working examples. Here's a nice example of an 0-size cushion. In it's a private case (I believe), as I think the original Hamilton cases had wire lugs. However, this is still a very nice and desirable example. And here it is again, paired with a WW-II era 10KGF cushion featuring a 6/0 986 movement with highly desirable "seconds at 9" dial. You can really see just how much bigger the 0-size version is compared with the later model. Here's another 0-size Cushion I recently overhauled. It's in a sterling silver case. This one was very interesting, as it had a couple of significant problems. First, it had a broken spring inside the watch that needed to be replaced. The second problem was a missing sleeve inside the stem tube of the case. Inside the watch there is a series of spring levers that switch the watch from the winding position to the time setting position. The 981 is a pocket watch movement. Like many pocket watch movements, it is "Negative Set". That means the movement's natural position is the time setting position. The stem is installed inside the case, not the movement. When the movement is installed in the case, the stem engages and pushes against the springs and that puts the watch into the "winding position". When the stem is pulled out, the pressure on the springs is removed and the watch goes back into it's natural setting position. That's probably confusing, I know. Think about it like a bathroom scale... when nothing is on it the scale is in position 0. When you step on the scale you compress the springs inside and it goes into the "display weight" position. Step off the scale and the springs inside push it back to position 0. A negative set movement does the same thing. Without a stem, it's in the setting position. Push the stem in and it goes into winding position. Take the stem out and it goes back into setting position. So in addition to a broken spring inside, this watch is missing the sleeve inside the case that holds the stem. This allows the springs inside the movement to push the crown out (as you can see in the photo). Once a new sleeve is installed it will hold the stem in the winding position and give you the "click" you feel when you pull the crown out to the set position. 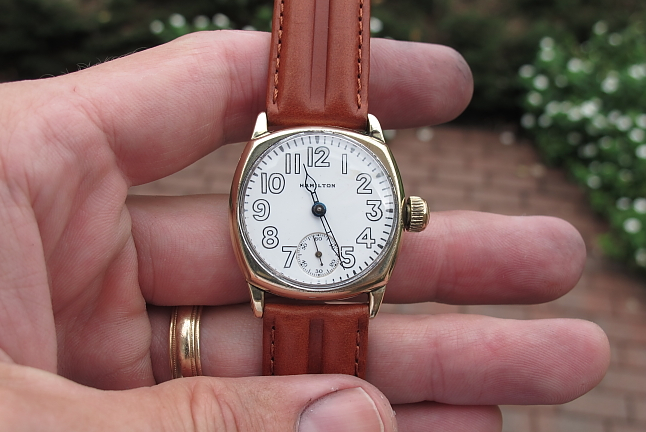 That's a good problem to have though, as it's probably a lot easier to find a sleeve than to find a new 981 movement.